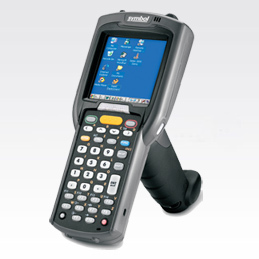 The gun configuration of the MC3000 hand-held mobile computer is small, lightweight and rugged for applications requiring high-quality data capture and high-performance real-time computing. Customisable to the demands of each jobs, it allows employees to complete their work faster and with better results. The pistol grip is ideal for scan-intensive environments, maximising comfort for your workers throughout a shift. For a complete list of all Motorola MC3000/MC3090 accessories click on the button below. How to warm boot the MC3000/MC3090? How do I cold boot the MC3000/MC3090? Does the Wavelink client come pre-licensed on the MC3090 gun? Yes. On the MC-3090 gun (pistol) version the Wavelink telnet client comes pre-licensed.